In Songs of Eternity and Sorrow, commissioned by Finzi Friends, Ian Venables continues a tradition of setting the English poet Alfred Edward Housman (1859-1936) for tenor, string quartet and piano. However, whereas Vaughan Williams and Ivor Gurney set poems from A Shropshire Lad, Venables has chosen lesser-known poems from More Poems and Additional Poems. The first, Easter Hymn is a powerful evocation of Housman’s religious anxiety and one that questioned the most fundamental tenet of Christianity, namely the Resurrection. The two-stanza poem is ideal for setting because of its bold and striking visual imagery. 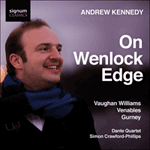 Venables achieves a myriad of changing moods with the introductory material for piano and string quartet belying later moments of tortured anguish. The dichotomous nature of the poem is further highlighted by a passage of sepulchral calm and mock majesty, simply to be shattered by a return to the movement’s opening idea, only this time uncompromising and challenging, as the poem’s final line demands that the God that is, ‘…come hither out of heaven and see and save’. If Easter Hymn shows Housman’s more strident poetic style, then the short pastoral poem When green buds hang redresses the balance. In this beautifully crafted lyric, Housman evoked the eternal ‘scholar gypsy’. This theme, combined with the poem’s pastoral imagery inspired Venables to express some of life’s more affirmative sentiments. Its feel of the Dorian mode sets in motion a gentle, oscillating triadic figure for strings that underpins the majority of this short but evocative setting. Two climaxes of breathtaking sensuality lead to a gentle coda. Ending on a low G natural from the piano, its mood is neither desolate nor affirmatory. The symphonic nature of Ian Venables’s Song Cycles—from a Mahlerian rather than Brahmsian standpoint—firmly places the emotional heart of each work in its final movement, leaving the penultimate song to act as a kind of scherzo. This is nowhere more apparent than in Housman’s Oh, who is that young sinner?, a clever and sardonic commentary on the trials that befell Oscar Wilde. In altering the ‘crime’ to ‘the colour of his hair’ Housman was able to suggest the absurdity of prejudice. Venables’s setting takes two important musical ideas, both of which—a strong rhythmic ostinato and the extensive use of the tritone—gives the movement an almost unbearable, claustrophobic sound-world. Each verse builds in tension as these two musical features vie for prominence. False hope is presented as the final verse, ratcheted up a semitone, builds into a frenzied climax on the words ‘for the colour of his hair’. Stricken, the music collapses in on itself. Because I liked you better is a sad, yet hauntingly beautiful poem that tells of an unrequited love which at that time was forbidden. The strong, yearning syncopation, peppered throughout the movement, allied to a harmonic language that can only be described as desolate, creates a landscape of unbearable poignancy. This is broken only by a short climax on the words ‘“Goodbye” said you “forget me”’ again suggesting mock majesty but in which irony rather than sincerity is the overriding musical sentiment. The coda to this movement contains some of the most beautiful music in the whole work ending a 21st century view of Housman which, in many ways, reveals a less familiar side of his creative life—an aspect that has, until recently, remained in the shadows, and as such has been unexplored by composers. It is nevertheless part of Housman’s creativity that demands a musical response in equal measure to the more ‘acceptable’ face of this ‘scholar poet’. No 3: Oh who is that young sinner?